Resist that title? I think not. A) Be an Agatha Christie rip-off. I could have handled Option A, but why read a rip-off when you can just read the real thing? Options B and C were out of the question. I'm not into the cookery mysteries, and I'll leave the Lillian Jackson Braun books to my sister. Agatha Raisin is self-made career business woman. She is not charming. She is not tactful. She is not a wheedler. She has no reservations about stealing someone's taxi. She does not back down and if she has a goal in sight, she will not change her behavior to spare anyone's feelings. She is described as being a "one-woman soft-cop/hard-cop combination". A force to be reckoned with. Agatha could have coped with a suspicious animosity but not this cheerful welcome which somehow still held her at bay. Not that Agatha had ever known how to make friends, but there was something about the villagers, she discovered, which repelled incomers. They did not reject them. On the surface they welcomed them. But Agatha knew her presence made not a ripple on the calm pond of village life. No one asked her to tea. No one showed any curiosity about her whatsoever. The vicar did not even call. In an Agatha Christie book the vicar would have called, not to mention some retired colonel and his wife. The way to get some attention, she decides, is simple: Win Carseley's Great Quiche Competition. Although Agatha has never baked a quiche in her life, and although the same woman has won it six years running, Agatha isn't intimidated. Agatha drives to London, buys a spinach quiche and enters it as her own. 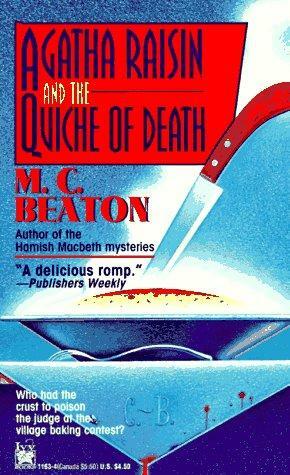 Then the judge dies of poisoning, and it was Agatha's quiche that did it. I loved her discovery of reading for pleasure (on Gone With the Wind: "She had been looking forward to a piece of intellectual slumming to celebrate her release from work, but she was amazed at how very good it was, almost indecently readable, thought Agatha, who had only read before the sort of books you read to impress people. ", and I hope that her reading choices continue to be mentioned in the later books. There were lots of references to her new-found love of Agatha Christie, and a brief reference to Cold Comfort Farm. The book also featured my new favorite amateur sleuth/policeman introduction. As for the mystery itself, I thought I'd figured it all out ahead of time, but it turned out I was oh-so-very wrong. Hooray! Pure entertainment. If you're looking for a new cozy series, this'd be a good one to try. It's going straight into my rotation of bath books, and I'll be picking up more as soon as I hit a used book store.